There are many human demands for water in Vermont. These range from industrial withdrawals and irrigation to making coffee and showering. Each of these uses, along with the requirements of our flora and fauna, have bearing on water quality and quantity. Some water uses in Vermont, such as snowmaking and public water distribution, are closely tracked. Others lack any quantification beyond broad estimates. Water-use refers to withdrawals from groundwater or surface water transported away from a source. (This does not include in-stream uses such as hydroelectric power.) Understanding the location and characteristics of these sources is essential piece of measuring water-use and calculating water budgets. In this post I will explore aspects of Vermont’s water-use and highlight how location is important for characterizing the state’s reliance on its water resources, as well as in forecasting future water-use requirements. The latest comprehensive look at water-use in Vermont is found in a USGS report published in 2010. The authors compiled measured and estimated water-use data in 2005 and projected future water-use in 2020 for each minor civil division in Vermont. In 2015, the National Water-Use Science Project updated this information for each county in the nation in the Estimated Use of Water in the United States report with an accompanying data release. The USGS has published these reports every five years since 1950. In 2005, thermoelectric cooling comprised over 75% of the water volume used daily in Vermont. However, with the decommissioning of Vermont Yankee in late 2014, drinking water is now the greatest water-use category in the state. Public water supplies serve approximately 60% of Vermont’s population and private water supplies serve the other 40%. In contrast, public water systems serve about 86% of the population nationally. I put together a python jupyter notebook that explores the drinking water information in the 2015 USGS report to clarify where Vermonters get their drinking water. To get some context for the state’s split between public and private water supplies I created a series of chloropleth maps, where darker shades of blue represent increasing percentage of the population served by public or private water supplies. The first two maps compare Vermont counties to all counties in the continental United States. These maps show that areas of the country such as the southwest US, eastern Massachusetts, southern Florida, and others have a high percentage of residents that rely on public water supplies. 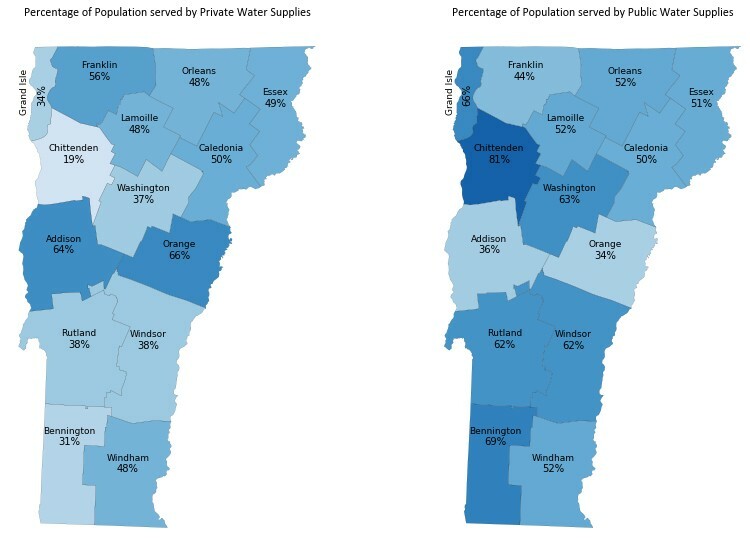 Vermont appears to have a higher percentage of residents with private water supplies than these areas, but not as much as parts of northern Michigan or Maine. A series of maps highlighting the percentage of the population that relies on public and private water systems by county in the continental United States and Vermont. The data is derived from the Estimated Use of Water in the United States in 2015 data release. I then took a closer look at the population percentages served by public and private systems by county in Vermont. 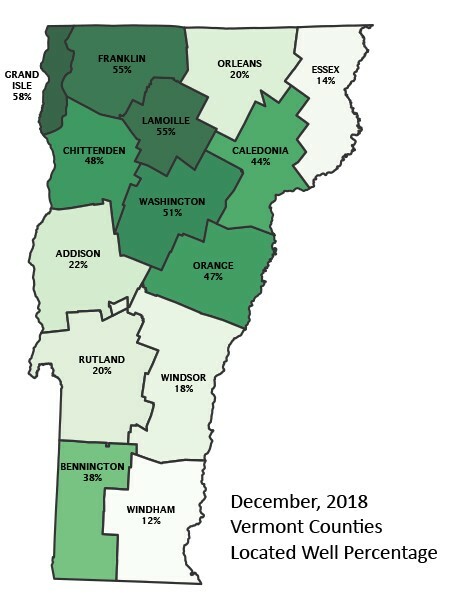 The maps below highlight the low percentage of residents in Chittenden County that rely on private water supplies and the relatively high percentages in Addison and Orange Counties. Procedures for creating these maps are located here. 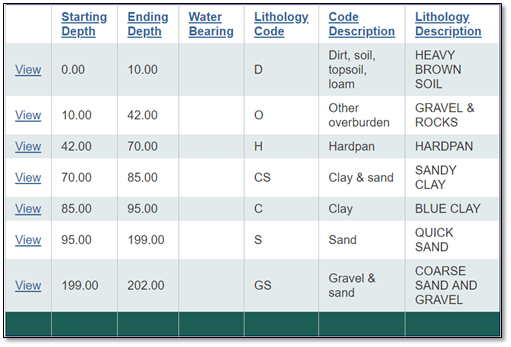 The USGS Viz Lab water-use site includes other interesting ways of exploring national water-use data. A private drinking water well casing and cap that extends above the land surface. A common sight across Vermont. It is not a surprise that many Vermonters rely on private water systems for their drinking water, but the USGS water-use reports only provide estimated values at the county level over the past 60 years. I calculated that in 2015 virtually all private water systems were groundwater-based. These systems were most likely developed by drilling or digging a well, and are documented in the state’s well completion reports, and associated geodata. These well completion reports contain information such as well diameter, casing length and material, the location and depth of the well, the materials penetrated when drilling, a driller’s yield measurement, and many other pieces of well information. The data contained in the well completion reports are a great resource for citizens, environmental companies, state agencies, health professionals, and researchers. The database contains over 110,000 boreholes that pierce Vermont’s land surface. These records are often a starting point for hydrogeologic investigations and are a component of the Vermont Geological Survey’s mapping projects. At a national scale, Bayless et al., 2017 examined the hydraulic properties of unconsolidated sediments in the glaciated United States by utilizing 14 million boreholes records from 25 states. An example lithologic log recorded while drilling a private drinking water well. In Vermont and other New England states, regional analysis of state borehole datasets provide insight into groundwater favorability and how groundwater divides can differ from surface watersheds. Well completion reports are also a tool that Vermont Geological Survey geologists and contractors use to estimate the thickness of glacial and post-glacial deposits as well as their potential to support certain water supplies. For water resources, accurate well locations and the associated lithologic logs provide insight into the partition of private water supplies in Vermont that are reliant upon surficial or bedrock aquifers. One shortcoming of the Vermont Well Completion Report database is the lack of reliable of well locations. Well completion reports since 2005 are required to list GPS coordinates, but many past records are not accurately located, or the accuracy of the location is unknown. There have been many incremental improvements in the number of accurately of located wells as the Vermont Geologic Survey has built well location ventures into their mapping projects, and non-profits, environmental consultants, and home owners have contributed revisions. With recent improvements in digital parcel and grand list data for Vermont, I am working on a series of additional improvements that leverage this information along with the notes, owner names, and pieces of addresses recorded in the well completion reports. I created a workflow in ArcGIS Pro that utilizes arcpy and the python library pandas, although many other tools could be used. The process collects relevant information for each well, pulls in matching grand list information, and highlights the potential parcels in which the well was drilled. This is a supervised workflow where the user then assesses the relevant information in an interactive map, and if it all aligns towards improvement of the well location, then the well is relocated to the E911 site on the parcel. A well relocation example. The well originally had a questionable location in the Lye Brook Wilderness. By combining the information provided in the well completion report, grand lists, and spatial parcel data the location of the well is improved to match the parcel and structure where it was drilled. Well locations adjusted through this approach contain an ‘E911 Address’ in the Location Determination Method field in the database to note the accuracy and reliability of the location. This change is also evident on the ANR Atlas, the most common way users interact with well information, as this field sets the symbology for the ‘Private Wells’ layer. For regional-scale analysis of thousands of wells (Bayless et al., 2017 or Gale et al., 2014) this level of precision is often enough. This approach also provides a good starting point for detailed hydrogeologic research, which often also requires precisely locating wells through surveying or with differential GPS units. I recently completed well location improvements using this method for all towns in Bennington, Washington, Lamoille, Orange, and Caledonia counties. The Vermont Geological Survey previously completed similar projects in Grand Isle, Chittenden, and Franklin counties. Even with these efforts there are still many wells without reliable locations. 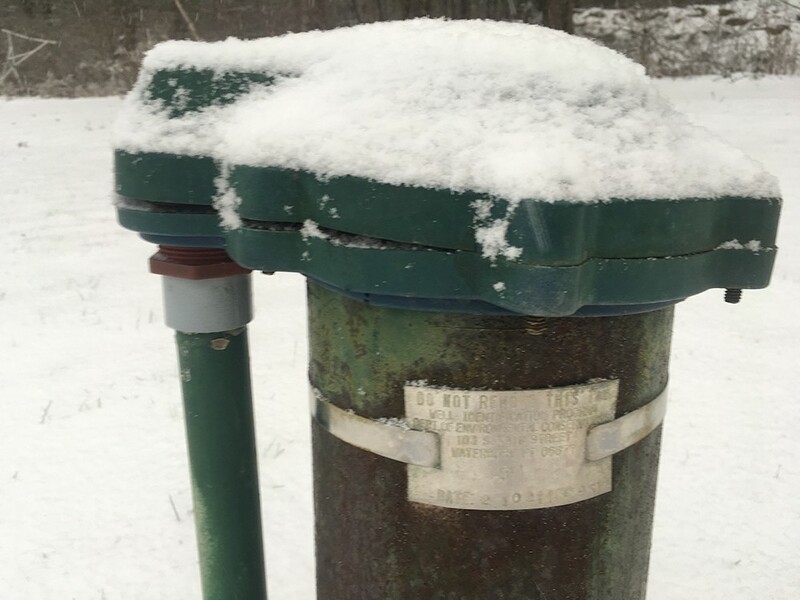 The DWGWPD launched a form that allows environmental professionals and the public to submit photos, locations, and other information they have regarding private drinking water wells in their area for review. This form is accessible through the ANR Atlas and can be found through the search tool or by clicking on a well after turning on the ‘Private Wells’ layer in the Drinking Water and Groundwater Protection drop down. Submissions through this form and additional quantification of Vermont’s water-use will allow for better understanding of our reliance on our water resources. Detailed information about the water sources Vermonter’s use can be combined with other map data such as LiDAR, parcels, and ownership information to allow an improved assessment of a source’s potential to provide water that meets water quality and water quantity needs. Welcome to the Vermont Center for Geographic Information on Medium - a blog about mapping, data, and all things geospatial in the Green Mountain State.